5665. Barbara Ruth KEYSOR (Loretta Ruth BITLER , Joseph Daniel , Daniel F , James , John , Johannes ). 10641 M i Eric D HOFFMAN. Scot A HOFFMAN 1 was born on 11 Dec 1964. He died on 11 Dec 1964. Barbara also married Leo DURHAM ""Pat"". + 10643 M iii Brian L DURHAM. 10644 M iv Greg P DURHAM. 5666. Dorothy Ann KEYSOR (Loretta Ruth BITLER , Joseph Daniel , Daniel F , James , John , Johannes ). + 10645 M i Bill (SMITH) WESTROM. Dorothy also married Warren B WESTROM "Wes". + 10646 M ii Bill (SMITH) WESTROM is printed as #10645. 10647 M iii Phillip WESTROM. 5670. Susan June REED (Doris Louise BITLER , Joseph Daniel , Daniel F , James , John , Johannes ). Susan married Robert Joseph WALTON. + 10648 M i Trevor WALTON. + 10649 F ii Amy Catherine WALTON. 10650 F iii Wendy Elaine WALTON. + 10651 M iv Hedlum Michael WALTON. + 10652 M v Dallas Reed WALTON. 5674. Robert Joseph COLDWELL (Hazel Vivian BITLER , Joseph Daniel , Daniel F , James , John , Johannes ). Robert married Barbara Jean OMANS "Barb". 10653 M i John Robert COLDWELL. 10654 M ii Ronald Joseph COLDWELL. 5675. Kenneth Carlyle COLDWELL [scrapbook] 1, 2 (Hazel Vivian BITLER , Joseph Daniel , Daniel F , James , John , Johannes ) was born on 23 Nov 1941. He died on 10 Jul 2018 in Beaverton, Gladwin Co, MI. Kenneth resided in Midland, MI. Kenneth married Kathryn Ann COUCHY "Kay Ann" [scrapbook] 1, 2, daughter of Phillip Alexander COUCHY and Leona Thresa MORAND, in 1965. Kay Ann was born on 15 Oct 1945 in Midland, MI. She died on 28 Oct 2017 in Henry Ford Hospital, Detroit, MI. Kay Ann resided in Oct 2017 in Midland, MI. 10655 M i Michael Kenneth COLDWELL. 10656 F ii Kendra Kay COLDWELL. + 10657 M iii Joseph Patrick "Joe" COLDWELL. 10658 F iv Jennifer COLDWELL. 10659 F v Michelle COLDWELL. 10660 F vi Amy COLDWELL. 10661 F vii Melissa COLDWELL. 10662 M viii Anthony COLDWELL. 10663 M ix Christopher COLDWELL. 10664 F x Amanda COLDWELL. 10665 F xi Morgan COLDWELL. 10666 F xii Autumn COLDWELL. 10667 F xiii Caitlyn COLDWELL. 5676. Berneta Marie "Berni" COLDWELL (Hazel Vivian BITLER , Joseph Daniel , Daniel F , James , John , Johannes ). Berni married Raymond Edwin GRAVES, son of George GRAVES and Grace. Raymond was born on 26 Mar 1944 in Battle Creek, Calhoun Co, MI. He died on 2 Mar 2002 in Anchorage, AK. Raymond graduated with ministerial degree from Great Lakes Bible College in 1966 in Lansing, MI. He resides in 1972 in Homer, AK. He resides from 1975 to 1995 in Willow, AK. He resides in Anchorage, AK. He worked with NANA Corp.. The cause of his death was complications of diabetes. + 10668 M i Benton Edward GRAVES. + 10669 F ii Nancy Jo GRAVES. 10670 M iii Brian Frank GRAVES. + 10671 M iv Jason GRAVES. 5678. Margaret Mae BITLER [scrapbook] 1, 2 (Percy Derraine , Etta Mae Bella , Daniel F , James , John , Johannes ) was born on 24 Jul 1920 in Mt Pleasant, Isabella Co, MI. She died on 8 Feb 1948 in Mt Pleasant, Isabella Co, MI. She was buried in Block S Lot 4, Riverside Cemetery, Mount Pleasant, Isabella Co, MI. 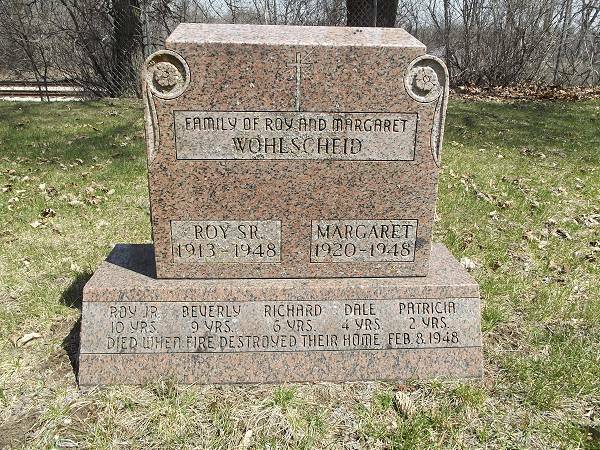 Margaret resided in 1930 in 408 Elizabeth, Mt Pleasant, Union Twp, Isabella Co, MI. The cause of her death was House Fire. 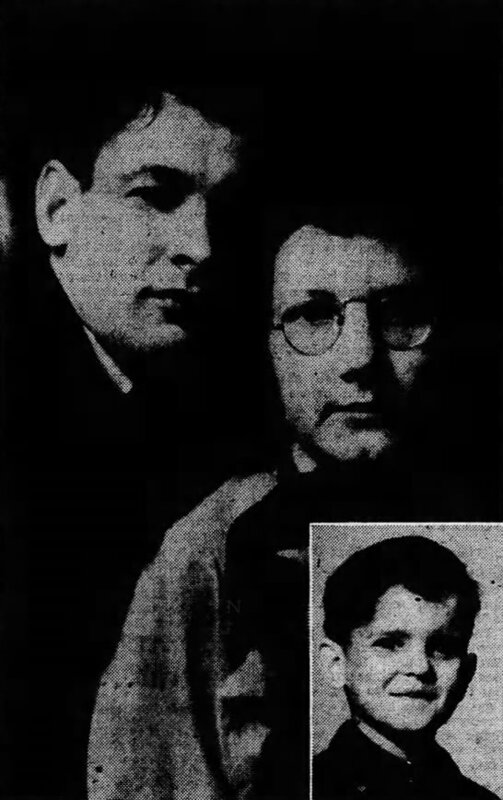 Margaret married Roy R WOHLSCHEID Sr [scrapbook] 1, son of Albert WOHLSCHEID and Elizabeth GROSS, on 6 Feb 1937 in Mt Pleasant, Isabella Co, MI. Roy was born in 1913. He died on 10 Feb 1948 in Mt Pleasant CommunityHospital, Mt Pleasant, Isabella Co, MI. He was buried in Block S Lot 4, Riverside Cemetery, Mount Pleasant, Isabella Co, MI. Roy worked with Worth machine Shop until 1948 in Mt Pleasant, Isabella Co, MI. The cause of his death was House Fire. Roy Mathew WOHLSCHEID Jr [scrapbook] was born on 24 Jul 1937 in Mt Pleasant, Isabella Co, MI. He died on 8 Feb 1948 in Mt Pleasant, Isabella Co, MI. He was buried in Block S Lot 4, Riverside Cemetery, Mount Pleasant, Isabella Co, MI. Beverly Jean WOHLSCHEID [scrapbook] was born on 3 Oct 1938 in Mt Pleasant, Isabella Co, MI. She died on 8 Feb 1948 in Mt Pleasant, Isabella Co, MI. She was buried in Block S Lot 4, Riverside Cemetery, Mount Pleasant, Isabella Co, MI. Richard Michael WOHLSCHEID [scrapbook] was born on 6 Oct 1941 in Mt Pleasant, Isabella Co, MI. He died on 8 Feb 1948 in Mt Pleasant, Isabella Co, MI. He was buried in Block S Lot 4, Riverside Cemetery, Mount Pleasant, Isabella Co, MI. Dale Lenwood WOHLSCHEID [scrapbook] was born on 9 Jan 1943 in Mt Pleasant, Isabella Co, MI. He died on 8 Feb 1948 in Mt Pleasant, Isabella Co, MI. He was buried in Block S Lot 4, Riverside Cemetery, Mount Pleasant, Isabella Co, MI. Patricia Ann WOHLSCHEID [scrapbook] was born on 22 Jun 1945 in Mt Pleasant, Isabella Co, MI. She died on 8 Feb 1948 in Mt Pleasant, Isabella Co, MI. She was buried in Block S Lot 4, Riverside Cemetery, Mount Pleasant, Isabella Co, MI. 5679. Dale Linwood BITLER 1, 2, 3, 4, 5 (Percy Derraine , Etta Mae Bella , Daniel F , James , John , Johannes ) was born on 9 Sep 1922 in MI. He died on 4 May 2008 in Jasper, Marion Co, TN. He was buried on 8 May 2008 in Sequatchie Valley Memorial Gardens, Jasper, Marion Co, TN. Dale resided in 1930 in 408 Elizabeth, Mt Pleasant, Union Twp, Isabella Co, MI. He resided in Feb 1948 in Pontiac, Oakland Co, MI. He was issued a social security number before 1951 in MI. He resided in Feb 1995 in 1122 Nickajack Cir, Jasper, Marion Co, TN. He was a member of Masonic Lodge Olive Branch 267. He was a member of Scottish Rights. He was a member of American Legion. He served in the military with U.S. Navy. Dale married S Almeda KINGSBURY on 4 Jan 1942 in Reed City, Osceola Co, MI. + 10677 M i Peter David BITLER Sr was born on 27 Jan 1944. He died on 17 Nov 2014. Dale also married Dovie Maxine WEST "Maxine" 1, 2, 3, daughter of Lawrence WEST and Bessie Mae BAIRD, about 1948. Maxine was born on 20 Jul 1929 in MI. She died on 12 Jun 2010 in At Home, Jasper, Marion Co, TN. She was buried on 15 Jun 2010 in Sequatchie Valley Memorial Gardens Mausoleum, Jasper, Marion Co, TN. Maxine resided from 1920 to 1982 in MI. She resided in Feb 1995 in 1122 Nickajack Cir, Jasper, Marion Co, TN. She resided from 1982 to 2010 in Jasper, Marion Co, TN. Roger Dale BITLER 1, 2 was born on 19 Jul 1948. He died on 11 Mar 1984 in Lake Orion, Oakland Co, MI. Roger resided in Mar 1984 in Lake Orion, Oakland Co, MI. + 10679 M iii Thomas Bradford "Tom" BITLER. 10680 F iv Shirley Ann BITLER. Shirley married Curtis ST GERMAIN Sr.
10681 F v Debra "Debbie" BITLER. 10682 F vi Mary BITLER. 5680. Delbert D "Pat" BITLER [scrapbook] 1 (Percy Derraine , Etta Mae Bella , Daniel F , James , John , Johannes ) was born on 1 Mar 1925 in Mount Pleasant, Isabella Co, MI. He died on 30 Nov 2012 in Hersey, Osceola Co, MI. He was buried on 4 Dec 2012 in Hersey Village Cemetery, Hersey, Osceola Co, MI. Pat resided in 1930 in 408 Elizabeth, Mt Pleasant, Union Twp, Isabella Co, MI. He graduated from Reed City High School in 1943 in Reed City, MI. He served in the military with U.S. Army from 1943 to 1946 in European And Pacific Theatres. He resided in Feb 1948 in Hersey, Osceola Co, MI. He worked as manager with Sears in Big Rapids, MI. He resided in 2003 in 7634 Meceola Rd, Hersey, MI 49639. He was a member of Hersey United Methodist Church. He was a member of V.F.W. Post No. 2964 in Reed City, MI. Pat married Dorothy M MORLOCK on 4 Oct 1946. + 10683 F i Jane A BITLER. + 10684 F ii Carol BITLER. + 10685 M iii Rev David A BITLER. 5681. Marcella Joy BITLER [scrapbook] 1, 2, 3, 4, 5 (Percy Derraine , Etta Mae Bella , Daniel F , James , John , Johannes ) was born on 28 Dec 1926 in Mount Pleasant, Isabella Co, MI. She died on 5 Jul 1996 in Iona, Iona Co, MI. She was buried in Clarksville Cemetery, Clarksville, Iona Co, MI. Marcella resided in 1930 in 408 Elizabeth, Mt Pleasant, Union Twp, Isabella Co, MI. She resided in Feb 1948 in Remus, Mecosta Co, MI. She was issued a social security number before 1951 in MI. She resided in Jul 1996 in Easton, Ionia Co, MI. Marcella married Wayne L T (SHAW) BOYDEN [scrapbook] 1, 2, son of George SHAW and Elva M STEINMAN. Wayne was born in 1922 in MI. He died on 1 Apr 1962 in Clarksville, Iona Co, MI. He was buried in Clarksville Cemetery, Clarksville, Iona Co, MI. 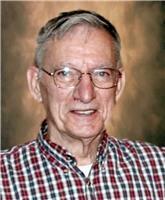 Wayne served in the military with U.S. Army - PFC from 24 Sep 1940 to 16 May 1945 in WW II. 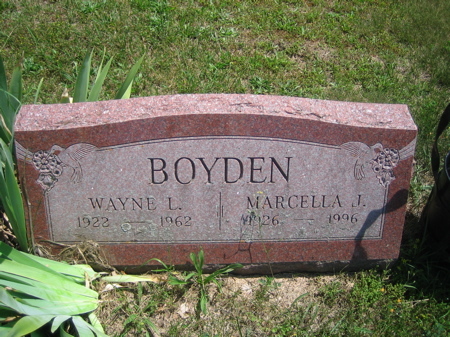 + 10686 M i Michael Wayne BOYDEN was born on 7 Dec 1944. He died on 13 Feb 2005. Patrick G "Pat" BOYDEN 1, 2 was born on 11 Jul 1947. He died on 10 Aug 2009. Pat resided in Feb 2005 in Port Huron, St Clair Co, MI. He resided in Aug 2009 in Mount Clemens, Macomb Co, MI. + 10688 F iii Glenna Lee BOYDEN was born on 18 Nov 1952. She died on 1 Nov 2004. 10689 M iv Robert "Rob" BOYDEN. 10690 F v Christine BOYDEN. Marcella also married Raymond FARRELL. 5700. 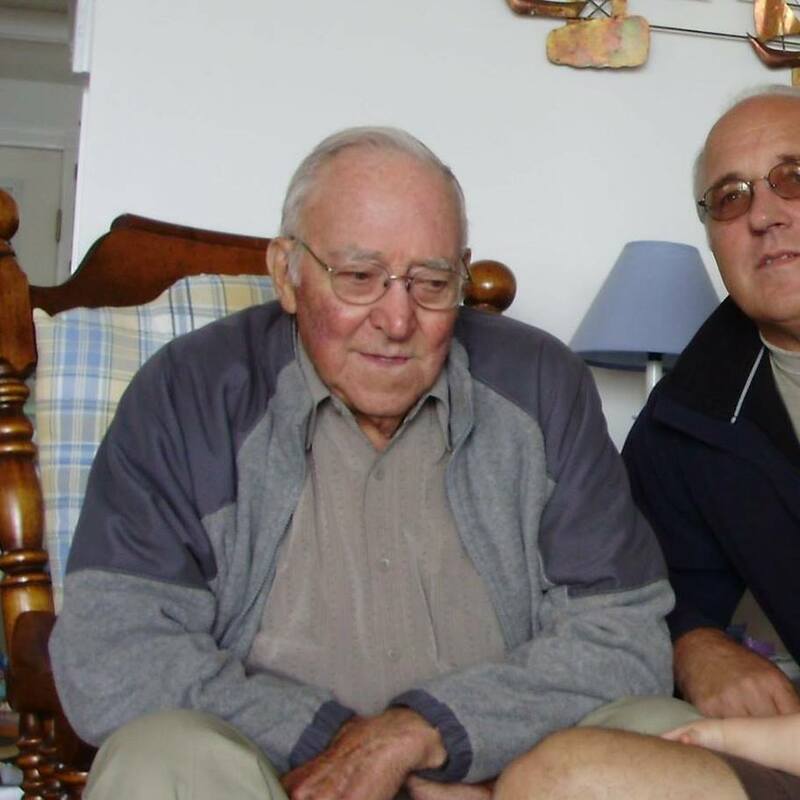 Donald R BETZ 1 (George Warren BETZ , Mary Cordelia SMITH , Mary Cordelia BITLER , James , John , Johannes ) was born on 13 May 1925 in Washingtonville, Montour Co, PA. He died on 31 Aug 2006 in Nathan Littauer Hospital, Gloversville, NY. He was buried on 6 Sep 2006 in Turbotville Cemetery, Turbotville, Northumberland Co, PA.
Donald resided in 1930 in 403 Main St, Watsontown, Northumberland Co, PA. He worked with Lewisburg Penitentiary until 1975 in Lewisburg, PA. He resided from 1975 to Sep 2006 in 143 South Shore Road, Caroga Lake, NY. He served in the military with U.S. Navy in WW II. Donald married Dorothy H HARMON on 30 Jun 1950. 10691 F i Linda S BETZ. 10692 M ii Steve R BETZ. 5706. Gloria L STAHLNECKER 1 (Cordelia Letora BETZ , Mary Cordelia SMITH , Mary Cordelia BITLER , James , John , Johannes ) was born on 3 Apr 1928 in Turbotville, Northumberland Co, PA. She died on 8 May 2008 in Muncy Valley Hospital Skilled Nursing Center. She was buried on 12 May 2008 in Muncy Cemetery, Muncy, Lycoming Co, PA.
Gloria graduated from Turbotville High School in 1946. She worked as part-owner/operator with Elsie & Gloria's Fabric Shop in Montoursville, Lycoming Co, PA. She was a member of Susquehanna Quilters Guild. She was a member of Messiah Lutheran Church in Clarkestown, Lycoming Co, PA. She resided until 2008 in 283 Kepner Hill Rd, Muncy, Lycoming Co, PA.
Gloria married Bruce C SONES on 23 Aug 1947. Jerry J SONES 1 was born on 24 Mar 1948 in PA. He died on 3 Sep 1967 in Kern Co, CA. Jerry was issued a social security number . + 10694 M ii Larry L SONES.